Bungie is staggering the roll-out of Destiny 2's prestige lairs to give clans an equal chance to race through each one and claim the "World's First" accolade. In Bungie's latest This Week at Bungie update, the team "took some time to set expectations" regarding the new raid lairs. "I just wanted to swing back around and give a quick update on some changes to the Prestige lair launch plan," writes senior designer Joe Blackburn. "Based on player feedback—and to ensure each World’s First race has a clean start—we’re changing the release times of each activity. 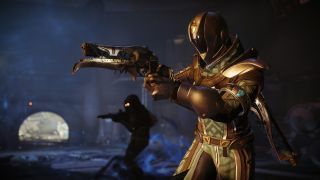 Eater of Worlds will receive a one-hour delay to ensure players have ample time to download and install Destiny 2 Update 1.2.3 once it becomes available. Spire of Stars has been delayed 24 hours to offset the activity releases." This means Eater of Worlds Prestige will go live at 11am PDT on July 17, 2018, with Spire of Stars Prestige releasing 23 hours later at 10am PDT on July 18, 2018. Blackburn wouldn't be drawn on what loadout and modifiers we might expect for the inaugural week, but did tease: "I've been looking out from my Time-Worn Spire and I feel an Autumn Wind blowing." If, like me, you're desperately hiding from the football (well, why else do you think I'm working today? ), don't forget that Destiny 2 is free to play for the weekend. So if you've yet to give Guardian life a go, get involved.